Cyclic hexapeptide antibiotic. 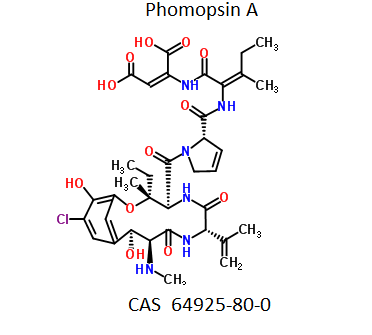 Phomopsin A exhibits very strong inhibitory properties of microtubule assembly. It binds to tubulin at a site different from the colchicine binding site. Soluble in Ethanol, Methanol, DMSO and DMF. Sparingly siluble in water. Not stable in watery solutions. (lit).